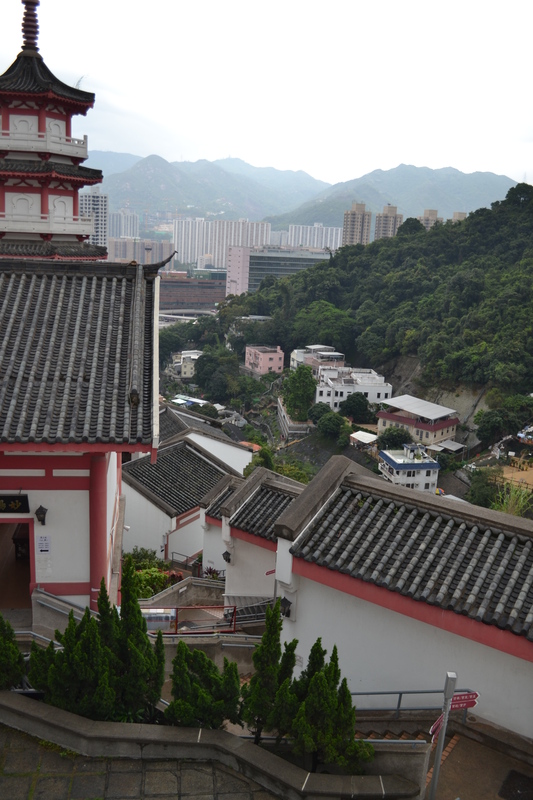 Ten thousand Buddhas – how hard could they be to find? More than you might imagine, it transpires, as I became one of the many travellers who mistakenly take the wrong turn toward the neighbouring cemetery. As I climbed the steps snaking up the hillside, I sensed that something was amiss when an outdoor escalator came into view. It seemed so very modern, so very un-temple like. I whipped out the scrap of paper on which I had hastily drawn a map copied from the internet. It was not the first time I’d wished I had come into the twenty-first century and bought a smartphone, and it wouldn’t be the last. As I headed higher, the strangeness of the place deepened. There was a stillness that was peaceful, and at the same time, slightly disquieting. I found myself walking through room after silent room, filled from floor to ceiling with name plaques and photographs. Finally, the penny dropped that this was not the monastery, but clearly a memorial of some kind. I toyed with the idea of turning back, but hesitated. Although the cemetery wasn’t on the typical tourist trail, it had an atmospheric quality to it and I was interested in seeing what lay ahead. Eventually, my curiosity won over; along with the hope that further up, there might be a way to reach the elusive temple. 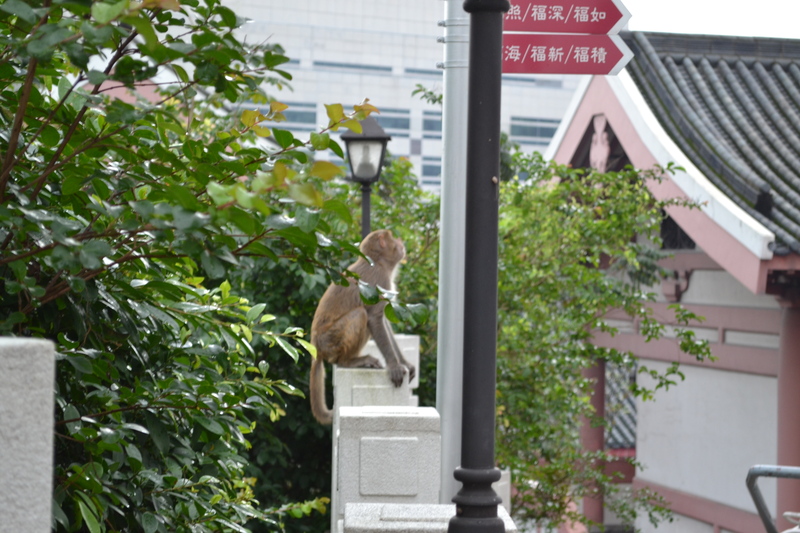 I stepped out of the building and froze as my impromptu detour was suddenly rewarded by the sight of a wild monkey. Fumbling for my camera, I followed it upward as it leapt effortlessly from one stone terrace to another. I wondered whether it would be my guide; if like some video game character, it would lead me down the right path. Unfortunately, my new friend would barely stay long enough to pose for a photograph, much less help me find the monastery. And so I was left alone to continue exploring the mysterious complex. After many twists and turns, I neared the top and finally spotted the tell-tale golden Buddha statues. Yet my sense of triumph was short-lived, for in a cruel twist of irony, I realised that I still could not reach them. Two fences and a drop of more feet than I could fathom separated us. If I wanted to see the Buddhas up-close, I would need to descend the steps and start all over again. 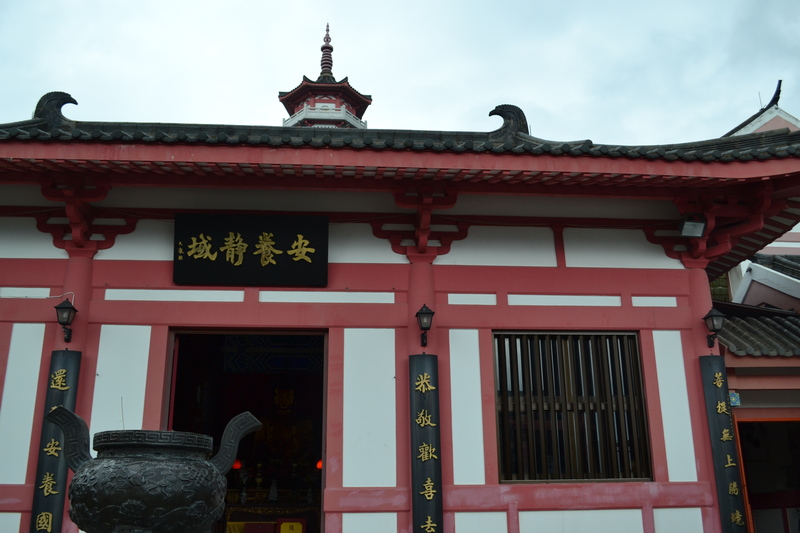 Later, I discovered that the cemetery I had stumbled upon was called the Po Fook Hill Ancestral Halls. While I would have never normally planned to visit this place, as an accidental wrong turn, it proved to be a very interesting one. From Sha Tin station, head to Pai Tau Street, veering left, and follow it round until you reach the Government Offices on the corner of Sheung Wo Che Road. Turn right on to this road and at the end you should find a small yellow sign pointing toward the monastery. For those interested in seeing the ancestral halls, continue straight down Pai Tau Street and you will soon see a white archway with stairs leading upwards. This is the entrance to the cemetery, so if you’re looking for the monastery, you know you’ve gone the wrong way!